Are you ready to flex your sock knitting muscles with a next-level challenge? How about psychedelic short rows that wrap your foot in color? Everything about this sock is weird, from the sideways construction to the heel that wraps around to the top of the foot, to the mirrored direction for sock two. Kirsten Hall’s “Sidetracked Socks” are full of fun techniques, and Laurie and Bree are here to demystify the pattern for you. You can totally do this! Familiarity with basic sock construction, and toe-up cast-on. Willingness to stretch your skills and trust the pattern. Modified intarsia in the round. After studying many examples of this pattern worked in different types of yarn, we recommend you select a hand-painted yarn for the main color and a solid or tonal for the contrast color. 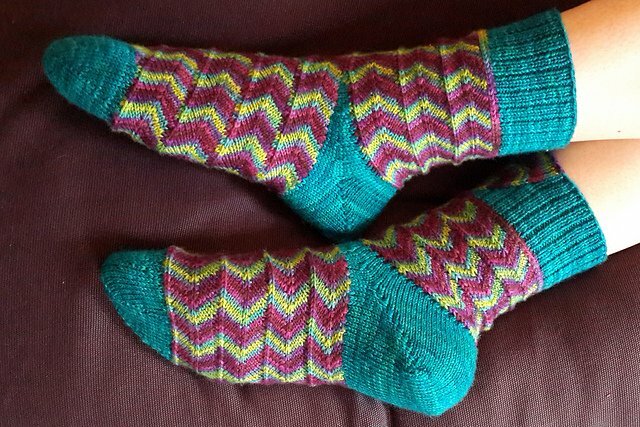 Self-striping, solids, tonals, and gradients for the main color will not give you the fun zig-zag effect that makes these socks so striking. If in doubt, ask the staff at StevenBe to help you select a yarn that will make this project pop. You will need around 200-300 yards of the main color and roughly 100 yards of the contrast color to be on the safe side. Requirements: Familiarity with basic sock construction, and toe-up cast-on. Willingness to stretch your skills and trust the pattern.